Just got a 560 CBCF which accounts for the bigger price tag. I will only comment of what's the same. This flipper is impressive. Seriously. For a production knife, I couldn't see asking for more. It's extremely comfortable to hold, feels as solid as a fixed blade knife. I am very impressed with how it feels in my hand. Lightweight for how big it is and sits well in the pocket. If you want a hard use knife that's comfortable to use and carry everyday, I don't believe you'd be disappointed with this knife. Got this knife new at a great price from a fairly well known private Kershaw dealer. Normally this knife is north of $200 and I probably would not have bought it. But I am glad I got it. It is a great knife. Fit and finish: Just about perfect for me. Blade is centered, no play, great finish on the titanium The lock is good - I am looking at about 50% engagement of the locking surface right now. Deep carry pocket clip. Lanyard hole. Fits my had well and has some well placed jimping. Feels solid despite the lightish weight. 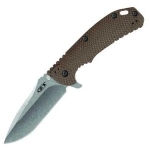 The edge was typical for ZT. More on that later. Flipper mechanism: Easy deployment with flipper (unassisted) or thumbstud. I don't normally use thumbstuds to open my knives because they just don't work well. They either need a great deal of "technique" or tear up my thumb or both. The 560 has plenty of room to get a good thumb hold and flip. Just keep your fingers from pressing on the lock side as you deploy and the blade swings out gracefully with flipper or thumbstud. Deployment was a little sticky when brand new but it has broken in beautifully. Blade: I sharpened this knife a few weeks ago. For whatever reason, ZT's do not ship with well finished edges. They are ok, just not super sharp. My guess is they leave it up to the buyer to make the edge they want. The 560 had a pretty steep angle so I took some time and brought down to about 18-20 degrees. Got it nice and sharp. Took about an hour on my Gatco. The steel seems good. This is my only Elmax blade and it seems light (7,600 kg/cubic meter vs 7,473 for S30V) for it's size. 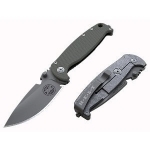 Highly rec this knife if you are in the market for a large folder. This is a knife for real men. People that don't like it are pussies. This knife states exactly what the company claims "Zero Tolerance". This thing is built like a tank. No matter how hard you try you will not be able to produce blade play. Yes it tears up your hands and fingers. But hey that's the nature of the beast. This thing will never fail you.